1. I was a square dancer throughout elementary and even into middle school. How mountain hick girl is that? I wore a poofy crinoline under some country gingham skirt and went through all these different moves with a partner (promenade, four-square, swing-your-partner, cloverleaf, etc.). Because I was usually the smallest girl, I was often teamed up with the lead boy (the "caller") at the front of the line-up. Our team was good. Really. We won awards. Once we even won the overall prize--the big giant trophy--at the Mountain Youth Jamboree (now called, I think, the Mountain Folk and Dance Festival). Of course, all the cool girls took ballet or jazz or modern dance or were wee cheerleaders. Square dancing wasn't really the "in" thing to do. Still, I did learn to clog and "buck dance," a sort of freestyle mountain form of clogging. 2. I played clarinet in the middle school band. Mostly I took band because, well, I don't know why I took band. I should have taken chorus because that's what the cool people did. But alas, I talked my poor mom into spending an outrageous amount on a clarinet and I screeched my way through two years of concerts. Until high school, when I quit. 3. One of the reasons I hated playing clarinet was that I also wore braces in middle school, and practicing the clarinet after getting my bands tightened was actually quite painful. Not only did I wear braces, I wore a head gear contraption designed to correct a very large overbite. It wasn't pretty, although I have to say the end result was worth it all. 4. When I was a child I l-o-v-e-d the Easter Bunny. Loved him with all of my heart. More than Santa. I wrote letters to the Easter Bunny. I asked him why he only came at night, why didn't he come during the day so I could talk to him and hug him. He wrote me back (in some rather atrocious handwriting, I must say) that he came at night because he was ashamed of his two buck teeth and his huge overbite. Oh my God! I think I even wrote him back that I, too, had teeth issues (the aforementioned overbite) and that he need not be ashamed around me because I loved him so. I don't remember if he ever responded to that one. I had so much faith in the Easter Bunny that one year I decided he would bring me a huge basket filled with chocolate and a stuffed rabbit as big as I was. It must have been that wish which prompted my low-income-single-parent-of-three-kids mother to finally tell me that there is no Easter Bunny. She told me while I was taking a bath. I was devastated. To her credit, I think she was, too. I'm pretty sure we both cried. 5. I'm not sure if this is related to the orthodontist-and-braces thing or to a bad experience I had one time, but I think I have developed a phobia of dentists. Sadly, I haven't been to see a dentist in, um, a while because I am too nervous and I don't want to have to go the sedation route. Like most phobics, I'll just avoid the thing I fear, right? I know, not such a good idea. That's the thing about phobias: they're unreasonable. It's in the definition. Look it up. 7. I'm stealing this from someone else, but, other than Sun-In (couldn't help it--it was what we did in the 80's), I have never once colored my hair. I have had one perm in my life, which was a major disaster. My mom thought I did it to spite her because we had a fight that day, but really I had planned it for a while. A girl I worked with talked me into letting her best friend or sister or something give me spiral perm. She said I'd have long, soft locks of perfect, loose curls. Instead, I had a huge mass of frizzy tight curls. Very not attractive. I confess, too, that I've always been a little vain about my hair. It's the one part of my looks that I actually like. My hair is thick, a nice shade of brown with touches of red, and has just enough natural curl in it. I never so much as blow-dry it to damage it, and I only wash it every few days so as not to dry it out. However, pretty much any time you see me, my hair will be pulled into a ponytail because it is getting on my nerves. Go figure. So there you have it: seven more things about me. I am a good hair, braces-wearing, square-dancing, clarinet-playing, Easter-Bunny-loving almost 40-year-old woman with a fear of dentists and heights. Oh, with a handsome hubby and two very cute kids. I won't tag anyone because it looks like everyone I would tag has already done this. If you haven't and you'd like to, please feel free, just let me know in the comments so I can learn more about you. I give you money and send you into the grocery store to pick up 5 items. You can only pick one thing from the following departments...what do you get? Produce: Let's see, am I trying to make a meal here or just getting random things I like best? If it's random things: blueberries (in season). If a meal (or if blueberries are not in season): onions. Bakery: fresh-baked garlic or rosemary bread. Frozen Goods: for a meal: shrimp. For me: Edy's chocolate raspberry ice cream. Dry Goods: pasta if I need a meal or cereal if I'm buying just for me. If I were to listen in on one of your conversations throughout the day, what 5 phrases or words would I be likely to hear? "My kids..."; "Sure! "; "Owen and Barrett..."; "The Girls..."; "Absolutely." I talk about my kids a lot, sorry. What 3 things do you find yourself doing every single day, and if you didn't get to do them, you wouldn't be in the best mood? 1. Brushing my teeth; 2. sleeping; 3. talking to Paul. Seriously, if he's out of town and I don't get to at least talk to him on the phone, I'm grouchy. You just scored a whole afternoon to yourself. We're talking a 3-hour block with no one around. What 5 activities might we find you doing? 1. Taking photos; 2. reading; 3. browsing a bookstore; 4. browsing the library; 5. blogging/surfing. We're going to the zoo. But, it looks like it could start storming, so it'll have to be a quick visit. What 3 exhibits do we have to get to? Are there dolphins? If so I would spend the whole time there. If not: 1. Monkeys; 2. Elephants; 3. Giraffes. You just scored tickets to the taping of any show that comes on TV. Your choice. You can choose between 4. What are your choices? I don't watch TV! But I guess I would go for: The Daily Show, Stephen Colbert, Oprah's Favorite Things Show, and any show that might have George Clooney, Colin Firth, or Jude Law appearing. You're hungry for ice cream. I'll give you a triple-dipper ice cream cone. What flavors can I pile on for ya? Mint Chocolate Chip; Rocky Road; Chocolate Raspberry. Someone stole your purse or wallet. In order to get it back, you have to name 5 things you know are inside to claim it. So, what's in there? My driver's license, my credit cards, a pair of child's pants (Olive Green with turquoise and pink embroidered flowers, size 3T), Burt's Bees Lip Shimmer stick in Watermelon, infant diapers (Size 3). You're at a job fair and asked what careers you're interested in pursuing. Let's pretend you have every talent and the ability to be whatever you wanted. What 4 careers would be fun for you? If you could go back to the old you, when you were in high school, and tell yourself 4 things, what would you say? Pay more attention to your grades. It really doesn't matter where you go to college as long as you do well. Do what you love and don't let anyone sway you from that. Go out with that boy with the dimples: He's the one! Okay, if you'd like to do this, consider yourself tagged. Let me know in the comments if you do so I can read your answers! That boy with the dimples and the fact that I did eventually go out with him. An upcoming date with the boy. My mother's help, especially with the car. Alissa of Life's Little Adventures (one of my most favorite blogs) has so kindly awarded my very first blog award. Woohoo. She has given me the Blogger Reflection Award. While I’ve always enjoyed her writing and her photography, lately she’s posted some thoughts that have really hit home with me. I think we are pretty similar in our thought processes and personalities, and hearing her voice some of the things going on in her head has given me the incentive to re-evaluate some of the things in my own head. She is referring, I believe, to my recent posts and ongoing conversation about trying to find peace and balance in my parenting, beginning with this post ("Finding peace with what is"), followed by this one ("More on finding peace") and this one ("Quick links post--on finding peace/balance"). As I've said before, if I can connect with at least one other person, find common ground, find a way of expressing something they are feeling, then I feel as if what I do is worth it. Because that's what my favorite writers and bloggers do for me (including Alissa). I think I'm supposed to now award this to someone else (five other someones). I'm not good at this. Picking people for things. Mostly because I want to honor folks but not burden them with having to do something about it (say continue the meme chain, for example). And I never know if I am just adding one more thing to their "to do" list, when my intention is to honor and celebrate them. I'm not making sense. I think I'll just go with the idea that someone thinking of me makes me happy, so maybe my passing it along to someone else makes them happy. 1. First off to Beth at Blue Ridge Blue Collar Girl. I've been corresponding with Beth for some time now when she wrote me a very nice email about my blog. She has finally taken her own step into the blogosphere, and it is already on my short list of very favorites. Beth really seems to take her time to see the world around her, to appreciate the beauty of the smallest of things. And I always appreciate that. 2. Jennifer at Pinwheels. Jennifer writes so eloquently and thoughtfully about parenting in general and parenting her special needs child in particular. But mostly she writes beautiful essays about her children, all of them, and how they make her feel. I learn so much from her gentle and loving approach. I want to be like her when I grow up. 3. Sara at Speaking of Simplicity. I found Sara one day when searching for blogs about Simplicity, Simple Living, etc. And I'm so happy that I did. I can identify with Sara. She is open, honest, and insightful. She is thoughtful, not preachy. She talks about her struggles, not just her successes. And, although her children are now grown and flown the nest, I can still identify with much of what she writes about. I find myself saying Yes. Yes, that's what I feel. Yes, that's what I think. Yes. That's all I'm going to award today. I might add two more later. But thank you Alissa. And to the rest of you: go read these other ladies. It'll be worth your time. I've been tagged again, this time, by Meghan at Gmama. Meghan has an adorable preschool boy, Gabriel, and a new baby boy, Kai, just a month (?) younger than Barrett. So her life (despite the fact that hers are boys and mine are girls and she lives in Texas while I live in NC) parallels mine in many ways. She seems to do a wonderful job of keeping it all in perspective, a trait I admire. 1. Eyeglass fitter, salesperson, office assistant to an optometrist. 2. Secretary at a typewriter sales and repair shop. (remember: I can't actually type). 4. Front desk person at a Holiday Inn. 1. Bridget Jones Diary (the first one). 2. Roman Holiday (Audrey Hepburn and Gary Cooper, oh yes). 3. The Land Before Time. 4. Sometimes, sometimes, I watch Grey's Anatomy online. 2. Acadia National Park, Bar Harbor, Maine. 3. Rodanthe, Cape Hatteras National Seashore, NC. 4. Fresh strawberries and blueberries. 4. You. If you want to do it, leave me a note in the comments and I'll link to you. Jennifer at Pinwheels and March Day at One March Day have both tagged me for an 8 Facts About Me Meme. I'm flattered, really, that they're both interested in learning more about me, so instead of Thursday Thirteen, I'll finally respond. I'm sorry I'm a little late. 1. I don't actually know how to type. I can't touch-type, that is. I never learned to do it properly and so derived a speedy three-finger style that gets me far, but startles anyone who watches me. My mother, on the other hand, can type about a million words a minute. 2. I am extremely nonathletic. (This may be the reason for #3 on this post). As a kid I had asthma; running left me breathless and wheezing, which is not very cool or pleasant when you're a kid. So I avoided most athletic activities and grew up to have no skills whatsoever. I cannot shoot a basketball, hit a baseball, swing a golf club, or run in any sort of elegant way. Generally I stay in my head or in a book (or, lately, in a computer). I do like to hike, though, and canoe and kayak (only still water). 3. Like March Day, I, too, am one of the 10% of the American workforce whose first job was at McDonald's. I was 15 years old and it was a brand new McDonald's in Asheville, NC. Our training was done before the store opened to the public and we all felt special to have been selected for such a privilege (good marketing on behalf of the managers). I worked the weekend breakfast shift and so my mom had to get up and drive me there every weekend morning by 5 a.m. (thanks, Ma). Most of the time, I worked the drive-through, but sometimes I worked the front and put together the milk-shake machine. I think I made something like $75 on my first paycheck and thought I was rich. A story I tell my students when talking about Freudian slips is that one day after working a double shift I answered the drive-through intercom with the phrase: "Welcome to McDonald's, I want to go home." 4. I once had the chance to enter the Creative Writing program at UNC-Chapel Hill as an undergraduate. I was given permission to study with Doris Betts. I started school As a freshman determined to go into journalism, like my dad. I told everyone that I chose UNC because, at least at the time, it was the second best school for journalism in the country--next to Columbia University. However, in the first journalism class I took, the instructor seemed to take such pleasure in tearing apart his young, vulnerable students that I was left with a bitter taste for it all. So I took Intro to Creative Writing and I loved it. My instructor once introduced me to a graduate student as a "good writer," and I was on top of the world. It was a difficult year, however, and I struggled with depression until, finally, I succumbed and left school. My transcript from that year shows several F's (I simply stopped attending many classes) and one A, in Creative Writing. 5. I am somewhat of a natural counselor. What I mean is that I have the kind of personality that makes people want to talk to me. My friend, Laura, called me "Doc" all through high school. Near strangers will tell me their life stories, their problems, their worries and concerns a short time after meeting me. It was a surprise to no one when I returned to school, finally receiving a Master's degree in counseling (from UNC, after all). 6. I have a bit of a thing for journals and I can't resist buying a new journal if I find one with the right look and heft to it. I love their feel, their scent, the promise of their blank pages. However, I can never fill a journal. Sometimes I will start one, recording quotes I like, or things for which I'm grateful, or maybe even my deepest thoughts. Inevitably, however, I will start to believe that my thoughts and words are not worthy of the journal, or my attention to it will wander, or I will make a mistake and believe the whole thing to be ruined. The journal will fall to a drawer or box, entries on only the first few pages. It wasn't always that way, though. In the attic, there is a trunk filled with journals from my angst-ridden teenage years. I won't review them but I cannot simply toss them out. When we moved Paul was horrified to find a file box filled with nothing but blank journals. 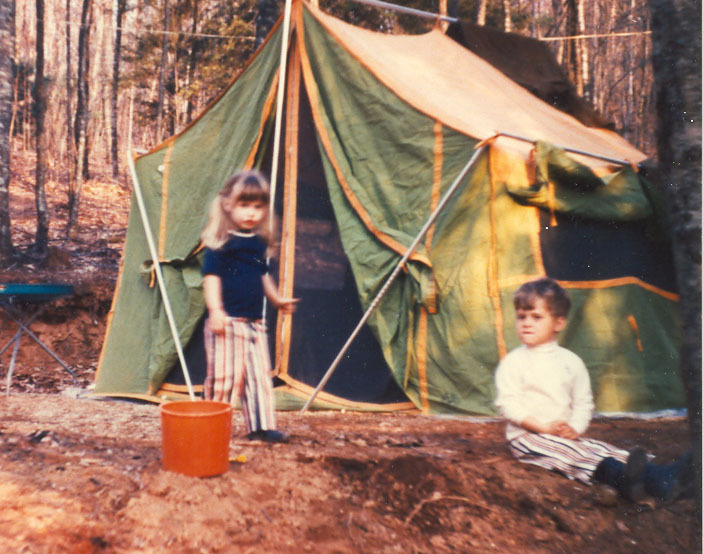 Yes that's me with the pony-tails and Winnie-the-Pooh pants. The other fashion plate is my brother, Stephen. Isn't it a great-looking tent? 8. I have always wanted to take classes at the John C. Cambell Folk School. Any class will do, although, I am partial to pottery, photography, writing, soap making, basketry, paper arts, or book arts. I would love to take one of the week-long or even longer intensive classes. I would settle for a weekend. There you have eight random things about me. I'm supposed to tag someone, but I won't. Nearly everyone I would tag has done this or something similar already. If you'd like to, however, please fell free to do so and let me know in the comments.